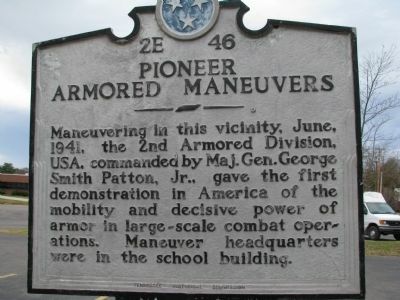 Maneuvering in this vicinity, June, 1941, the 2nd Armored Division, USA, commanded by Maj. Gen. George Smith Patton, Jr., gave the first demonstration in America of the mobility and decisive power of armor in large-scale combat operations. Maneuver headquarters were in the school building. Location. 35° 28.734′ N, 86° 5.06′ W. Marker is in Manchester, Tennessee, in Coffee County. Marker is on Murfreesboro Highway (U.S. 41), on the left when traveling north. Touch for map. Marker is in this post office area: Manchester TN 37355, United States of America. Touch for directions. (approx. 0.4 miles away); Experiment in Armor (approx. 0.7 miles away); Old Stone Fort (approx. one mile away); Granny Hickerson Cemetery (approx. 2 miles away); General Henry H. "Hap" Arnold (approx. 5.1 miles away). Touch for a list and map of all markers in Manchester. More about this marker. 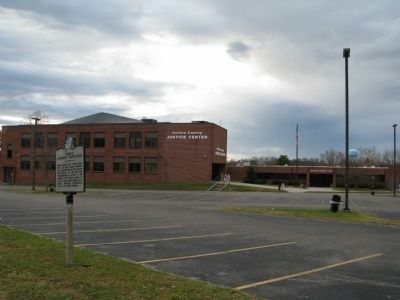 The school building is now the County justice center and jail. More. Search the internet for Pioneer Armored Maneuvers. Credits. This page was last revised on July 30, 2017. This page originally submitted on November 29, 2009, by Tom Gillard of Tullahoma, Tennessee. This page has been viewed 916 times since then and 7 times this year. Photos: 1, 2. submitted on November 29, 2009, by Tom Gillard of Tullahoma, Tennessee. • Kevin W. was the editor who published this page.